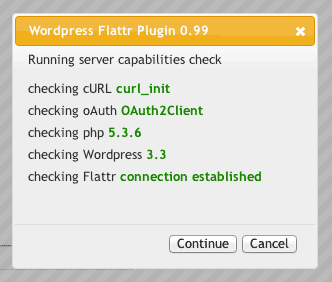 to make it easy to set up a Flattr app connection. It will run a several steps set up process so you can easily connect to Flattr. It is virtually a boiled down fix to all the feedback I received about the plugin. It will check for certain features that your blogs installation must support or else the feature will not activate. Currently, these features are checked very restrictively for compatibility reasons but may be less restrictive in the final version.